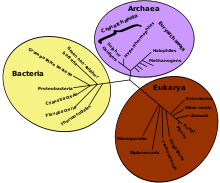 Genetic diversity is the total number of genetic characteristics in the genetic makeup of a species. It is distinguished from genetic variability, which describes the tendency of genetic characteristics to vary. Genetic diversity serves as a way for populations to adapt to changing environments. With more variation, it is more likely that some individuals in a population will possess variations of alleles that are suited for the environment. Those individuals are more likely to survive to produce offspring bearing that allele. The population will continue for more generations because of the success of these individuals. The academic field of population genetics includes several hypotheses and theories regarding genetic diversity. The neutral theory of evolution proposes that diversity is the result of the accumulation of neutral substitutions. 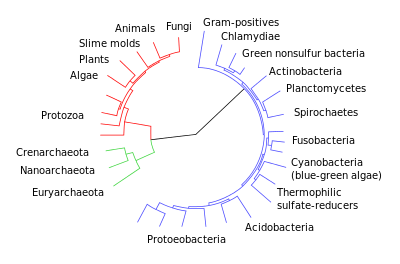 Diversifying selection is the hypothesis that two subpopulations of a species live in different environments that select for different alleles at a particular locus. This may occur, for instance, if a species has a large range relative to the mobility of individuals within it. Frequency-dependent selection is the hypothesis that as alleles become more common, they become more vulnerable. This occurs in host–pathogen interactions, where a high frequency of a defensive allele among the host means that it is more likely that a pathogen will spread if it is able to overcome that allele. A 2007 study conducted by the National Science Foundation found that genetic diversity and biodiversity (in terms of species diversity) are dependent upon each other—that diversity within a species is necessary to maintain diversity among species, and vice versa. According to the lead researcher in the study, Dr. Richard Lankau, "If any one type is removed from the system, the cycle can break down, and the community becomes dominated by a single species." Genotypic and phenotypic diversity have been found in all species at the protein, DNA, and organismal levels; in nature, this diversity is nonrandom, heavily structured, and correlated with environmental variation and stress. The interdependence between genetic and species diversity is delicate. Changes in species diversity lead to changes in the environment, leading to adaptation of the remaining species. Changes in genetic diversity, such as in loss of species, leads to a loss of biological diversity. Loss of genetic diversity in domestic animal populations has also been studied and attributed to the extension of markets and economic globalization. Genetic diversity plays an important role in the survival and adaptability of a species. When a population's habitat changes, the population may have to adapt to survive; the ability of the population to adapt to the changing environment will determine their ability to cope with an environmental challenge. Variation in the population's gene pool provides variable traits among the individuals of that population. These variable traits can be selected for, via natural selection, ultimately leading to an adaptive change in the population, allowing it to survive in the changed environment. If a population of a species has a very diverse gene pool then there will be more variety in the traits of individuals of that population and consequently more traits for natural selection to act upon to select the fittest individuals to survive. Genetic diversity is essential for a species to evolve. With very little gene variation within the species, healthy reproduction becomes increasingly difficult, and offspring are more likely to have problems resulting from inbreeding. The vulnerability of a population to certain types of diseases can also increase with reduction in genetic diversity. Concerns about genetic diversity are especially important with large mammals due to their small population size and high levels of human-caused population effects. When humans initially started farming, they used selective breeding to pass on desirable traits of the crops while omitting the undesirable ones. Selective breeding leads to monocultures: entire farms of nearly genetically identical plants. Little to no genetic diversity makes crops extremely susceptible to widespread disease; bacteria morph and change constantly and when a disease-causing bacterium changes to attack a specific genetic variation, it can easily wipe out vast quantities of the species. If the genetic variation that the bacterium is best at attacking happens to be that which humans have selectively bred to use for harvest, the entire crop will be wiped out. A very similar occurrence is the cause of the infamous Potato Famine in Ireland. Since new potato plants do not come as a result of reproduction, but rather from pieces of the parent plant, no genetic diversity is developed, and the entire crop is essentially a clone of one potato, it is especially susceptible to an epidemic. In the 1840s, much of Ireland's population depended on potatoes for food. They planted namely the "lumper" variety of potato, which was susceptible to a rot-causing oomycete called Phytophthora infestans. This oomycete destroyed the vast majority of the potato crop, and left one million people to starve to death. The genetic diversity of livestock species allows animal production to be practiced in a range of environments and with a range of different objectives. It provides the raw material for selective breeding programmes and allows livestock populations to adapt as environmental conditions change. Livestock biodiversity can be lost as a result of breed extinctions and other forms of genetic erosion. As of June 2014, among the 8 774 breeds recorded in the Domestic Animal Diversity Information System (DAD-IS), operated by the Food and Agriculture Organization of the United Nations (FAO), 17 percent were classified as being at risk of extinction and 7 percent already extinct. There is now a Global Plan of Action for Animal Genetic Resources that was developed under the auspices of the Commission on Genetic Resources for Food and Agriculture in 2007, that provides a framework and guidelines for the management of animal genetic resources. Awareness of the importance of maintaining animal genetic resources has increased over time. FAO has published two reports on the state of the world's animal genetic resources for food and agriculture, which cover detailed analyses of our global livestock diversity and ability to manage and conserve them. The natural world has several ways of preserving or increasing genetic diversity. Among oceanic plankton, viruses aid in the genetic shifting process. Ocean viruses, which infect the plankton, carry genes of other organisms in addition to their own. When a virus containing the genes of one cell infects another, the genetic makeup of the latter changes. This constant shift of genetic makeup helps to maintain a healthy population of plankton despite complex and unpredictable environmental changes. 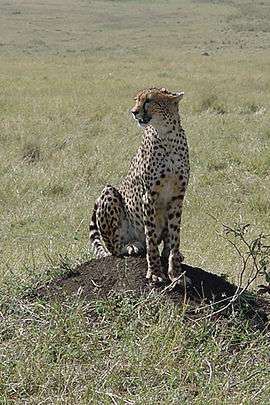 Cheetahs are a threatened species. Low genetic diversity and resulting poor sperm quality has made breeding and survivorship difficult for cheetahs. Moreover, only about 5% of cheetahs survive to adulthood. However, it has been recently discovered that female cheetahs can mate with more than one male per litter of cubs. They undergo induced ovulation, which means that a new egg is produced every time a female mates. By mating with multiple males, the mother increases the genetic diversity within a single litter of cubs. Genetic Diversity of a population can be assessed by some simple measures. Gene Diversity is the proportion of polymorphic loci across the genome. Heterozygosity is the fraction of individuals in a population that are heterozygous for a particular locus. Alleles per locus is also used to demonstrate variability. Nucleotide diversity is the extent of nucleotide polymorphisms within a population, and is commonly measured through molecular markers such as micro- and minisatellite sequences, mitochondrial DNA, and single-nucleotide polymorphisms (SNPs). There are broad correlations between different types of diversity. For example, there is a close link between vertebrate taxonomic and ecological diversity. 1 2 "National Biological Information Infrastructure". Introduction to Genetic Diversity. U.S. Geological Survey. Archived from the original on February 25, 2011. Retrieved March 1, 2011. ↑ Nevo, Eviatar (May 2001). "Evolution of Genome-Phenome Diversity under Environmental Stress". Proceedings of the National Academy of Sciences of the United States of America. 98 (11): 6233–6240. doi:10.1073/pnas.101109298. JSTOR 3055788. PMC 33451 . PMID 11371642. ↑ Tisdell, C. (2003). "Socioeconomic causes of loss of animal genetic diversity: analysis and assessment". Ecological Economics. 45 (3): 365–376. doi:10.1016/S0921-8009(03)00091-0. ↑ Pullin, Andrew S. (2002). Conservation biology (1st publ. ed.). Cambridge: Cambridge University Press. ISBN 9780521644822. ↑ Paetkau, David; Waits, Lisette P.; Clarkson, Peter L.; Craighead, Lance; Vyse, Ernie; Ward, Ryk; Strobeck, Curtis (2008). "Variation in Genetic Diversity across the Range of North American Brown Bears". Conservation Biology. 12 (2): 418. doi:10.1111/j.1523-1739.1998.96457.x. ↑ "Monoculture and the Irish Potato Famine: cases of missing genetic variation". University of California Museum of Paleontology, Berkeley, California. Retrieved 2014-03-28. ↑ FAO. 2015. The Second Report on the State of the World’s Animal Genetic Resources for Food and Agriculture. Rome. ↑ FAO. (2015). The Second Report on the State of the World’s Animal Genetic Resources for Food and Agriculture. Rome. ↑ "Scientists Discover Interplay Between Genes and Viruses in Tiny Ocean Plankton". National Science Foundation. March 23, 2006. Retrieved December 12, 2008. ↑ Fildes, Jonathan (May 29, 2007). "Cheating cheetahs caught by DNA". BBC News. Retrieved December 12, 2008. ↑ Kawabe, K.; Worawut, R.; Taura, S.; Shimogiri, T.; Nishida, T.; Okamoto, S. (2014-01-01). "Genetic Diversity of mtDNA D-loop Polymorphisms in Laotian Native Fowl Populations". Asian-Australasian Journal of Animal Sciences. 27 (1): 19–23. doi:10.5713/ajas.2013.13443. ISSN 1011-2367. PMC 4093284 . PMID 25049921. ↑ Sahney, S.; Benton, M.J. & Ferry, P.A. (2010). "Links between global taxonomic diversity, ecological diversity and the expansion of vertebrates on land". Biology Letters. 6 (4): 544–547. doi:10.1098/rsbl.2009.1024. PMC 2936204 . PMID 20106856.